Brother XR9500PRW Review (April 2019): Is This Machine For You? Brother XR9500PRW Review: Is this Sewing Machine for You? Looking for a quality sewing machine that is affordable, versatile, and expandable? Then you’ve landed on the right page. Here, we’re going to analyze one of the more popular models today - the Brother XR9500PRW Limited Edition Project Runway sewing machine. It’s a computerized model with plenty of bells and whistles. And it’s not just for sewing either. This model is good for quilt making too. Standard accessories give you plenty of choices. This is a sewing machine that can grow with you while helping you unleash your inner creativity. Everything is not great; we've also covered negatives in this Brother xr9500prw review. More on that later. What's the speed of this machine? How good is the motor? Is it easy to setup and use? Is it compact and lightweight? How many styles of Buttonholes? How many feet come with this machine? Who is this machine best suited for? Can this sewing machine handle upholstery fabrics? Will this work on denim? Can I use this machine as serger? Is this a heavy-duty sewing machine? Is this a programmable sewing machine? It offers extensive sewing capabilities. This model offers a maximum sewing speed of 850 stitches per minute. You can control the speed with the speed controller. Although there are machines with more speed, it is more than enough for many users. The motor is not a monster. But it's certainly powerful enough to sew through most materials you will likely be working with. It's also relatively quiet, much quieter than those old Singer sewing machines. As Easy As It Is To Use, It’s Even Easier To Set-Up. 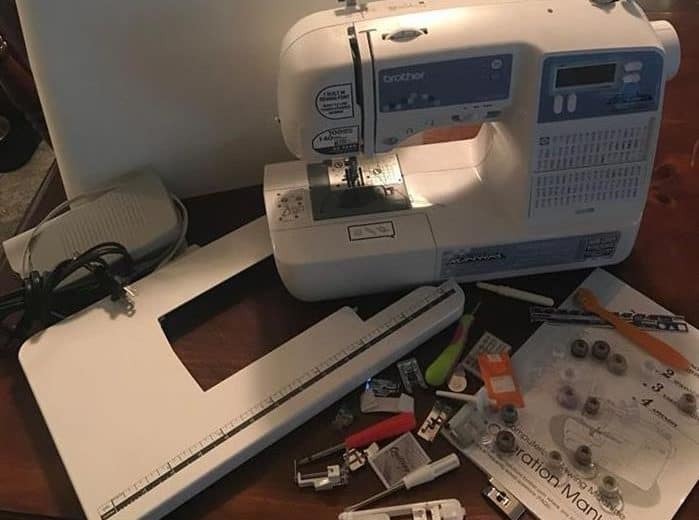 Once unboxed, the Brother xr9500prw is ready for use right away - so it's ideal for anyone who likes to get right into sewing - without needing to assemble many parts. And because it's so easy to use, it’s a favorite of beginners everywhere. It measures 11.45 inches high x 6.69 inches wide x 16.02 inches deep. As far as weight goes, it tips the scales at just over 9.9 pounds. If you can carry a sack of potatoes, you can certainly manage to move this Brother sewing machine around. It's actually easier to carry than a sack of potatoes - thanks to the built-in handle and protective outer case. This model offers 55 alphanumeric stitches so you can use it for basic lettering or ﻿monogramming﻿ to personalize items like bathrobes and towels. However, there’s only one font included with this sewing machine. There are also eight different styles of buttonholes, with each requiring a single step to completion. This added convenience comes in very handy to give you fast, easy, accurate, and professional-looking ﻿buttonholes﻿ every time. Just insert the buttonhole presser foot, then adjust the size to accommodate the buttonholes based on the style of button you've selected, and you’re good to go. What you're getting is a computerized sewing machine from a famous name brand that delivers impressive usability and versatility. It comes with an oversized work table means that it is ﻿especially useful for quilting﻿. But it's also handy for other projects as well. Included with every purchase is a needle set, ballpoint needle, twin needle, and the three bobbins enclosed. There's also an extra spool pin, seam ripper, cleaning brush, screwdriver, foot controller, manual, plus the hard exterior cover. When you consider what it does and all the accessories included as standard, it’s clear that Brother delivers both good value and functional variety packed into a relatively small machine. Additionally, there are seven different presser feet included with your purchase of the Brother XR9500 PRW. These feet are easy to adjust, and the digital display tells you which foot is the right one to use in any given situation. These alone give you a ton of flexibility and functionality. But you can also purchase additional presser feet - several dozen of them - to create different ﻿stitches﻿ and expand the possibilities that much further. The ease with which you can use and learn this machine makes it a perfect machine for beginners. You can start wherever you are and grow to learn a variety of things. It's a machine that can serve you as you grow and expand your capabilities. If you are a student of the craft of sewing and/or quilting, you'll find three-speed control slider very helpful. Additionally, it can be a worthwhile option for intermediate sewists who may have outgrown their older, ﻿more ﻿﻿﻿﻿﻿﻿basic﻿﻿﻿﻿﻿﻿﻿ model like jx2517. Advanced users may still appreciate the variety of stitches available, automatic buttonholes, and the work table that's suitable for quilting. The advanced users need features like knee lifter, manual presser foot pressure control, and bigger throat space; which most machines including this one don't have in this price range. Ultimately it depends upon your usage requirements. If you've industrial heavy duty projects to work on, we will hesitate to recommend the Brother xr9500prw to you. Brother has become a well-known brand in the sewing machine market with good reason. They make decent quality machines that are reasonably-priced. And they’re not afraid to stand behind this product either with a 25-year, limited warranty. Your Brother sewing machine should work perfectly right out of the box it’s shipped in. But should you have any issues whatsoever, when you first get your machine or years down the line - it’s comforting to know that limited warranty is there. Yes. The Brother xr9500 can handle many different fabrics including upholstery. However, if you're working with a thicker fabric, be sure to read the instructions first. You've also got to be sure that you're using the proper needle. Many users report that sewing on thicker fabrics is no problem at all, so long as they take their time and use the proper needle. This is critical. I wouldn't recommend this machine if that's all you're doing, however. It’s not an industrial machine. So if you consistently push it to the limit, you’re asking for trouble. But this is the case with any brand of machine you buy in similar price range. In most cases, yes. You shouldn't have any problem sewing denim. This machine is strong enough to sew on patches, make denim shoulder bags or purses, and so on. You may have a tougher time with thick ﻿﻿﻿﻿﻿﻿hems﻿, however. Be sure to select the appropriate needle. No. This machine can’t be used as serger machine. But there is an alternative. By using the overcast presser foot, you can create a stitch that looks quite similar to a serge stitch. No, we wouldn't call it heavy duty machine. Even though it’s capable of performing many sewing related tasks and doing it well, the machine itself lacks the ruggedness of the old-style, all steel sewing machines from days gone by. Sadly, those days are gone forever. Nothing lasts like it used to. That’s just the way it is. As it turns out, the Brother sewing machine xr9500prw can perform admirably in multiple ways. Faux suede, faux leather, and even multiple layers of quilts have proven to be no problem for this machine. But it’s not recommended for leather or other heavy duty fabrics. It's not a commercial grade machine by any stretch of the imagination. To an extent, yes, you can program this one. For example, if you want to sew specific words onto your products, it can stitch the entire word, you don’t need to stop and enter each letter individually. The machine also automatically reinforces the stitch of each letter as you sew, so you get strong, finished stitch that looks great. The LED also show you which presser foot goes with which stitch. The Brother 9500 prw is economical, easy to set up, and equally easy-to-use. For those of you who don’t like tinkering with machines, this one is a dream. You can be set up and ready to sew whatever you’d like just moments after your machine arrives at your door. Computerized stitch selection makes it super easy for the sewist to switch from one stitch to another. With the flip quick stitch guide, you can effortlessly reference the particular stitch number you want to work with. It comes with a “free arm” to make it easier to sew sleeves and cuffs. The oversized work table and drop feed dogs are helpful in quilting. Other favorite features include adjustable sewing speeds, multiple needle positions (very helpful), the alphanumeric font for adding letters or monogramming clothing and accessories and the hard shell cover to protect the machine. Although this machine has multiple thread cutters that will save you time. However, those are not automatic thread cutters by definition. There is no scissor button on the machine that you can press to cut the thread automatically. It just has blades that help in manual thread cutting. As capable as the Brother International sewing machine xr9500prw is, it isn't the best machine to sew heavy duty thick fabrics. If you like to sew with heavier fabrics, your best bet is to look at different options - ﻿machines ﻿﻿﻿﻿that ﻿﻿﻿﻿can ﻿﻿﻿﻿﻿﻿h﻿andle ﻿﻿leathe﻿r﻿ and other heavy materials with relative ease. Throat area of the machine is not that bigger either. If you like to move around and transport your machine, this machine does not come with a roller bag or carrying case. However, there is a hard cover to protect the machine from dust. With its 100 stitch designs and easy functionality, the Brother XR9500PRW computerized sewing machine can give you endless hours of family fun, creative expression and money-saving opportunities. The Brother xr9500 project runway computerized sewing machine offers a vast array of convenience features. It's designed by industrial engineers who are obviously well-versed in the sewing experience. It’s quite clear that they understand what's most important to consumers. When you combine the economical price of the Brother International Sewing Machine xr9500prw with its wide range of features, and the quality of work it produces makes it a winner. We are happy to recommend this model to you. It’s an above-average performer that makes sewing a fun and richly satisfying endeavor. And the added feature of being able to monogram your work gives you one more reason for choosing this model over something else. How To Easily and Cheaply Create A Dollhouse Or Toy Storage? How To Make A Pop Up Card For Beginners Step By Step? SewOrbit is a participant in the Amazon Services LLC Associates Program, an affiliate advertising program designed to provide a means for sites to earn fees by linking to Amazon.com and affiliated sites. As an Amazon Associate SewOrbit earns from qualifying purchases.